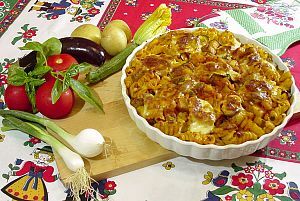 This preparation is my own recipe that is a delicious fusion of pasta and curry. Wash and cut Chicken thighs in halves. Heat oil in a fry pan, add onion slices. Cook covered till onion turns light brown while stirring occasionaly. Add garlic and ginger paste, mix and then add chicken. Fry for 5-6 minutes. Add turmeric, coriander, cumin and chili powder, salt. Mix and cover. Reduce heat to medium and check occasionaly for excessive dryness. You may add a quarter cup of water at one time and continue simmering till oil seperates from masala. This step ensures that all ingredients cook properly to form thick gravy. You may be tempted to add a lot of water and let it simmer but that shortcut will lose the color and aroma from the preparation. Add approximately 2 to 3 cups (as desired) of water and bring it to boil. Remove Chicken pieces and Add pasta. Cover and let it simmer till the pasta is soft yet firm. Hand shred or cut chicken thighs in smaller pieces and return to the pasta. Heat butter then add cumin seeds, bay leaves,and whole red chili. Let it brown a little. Mix quickly in the Curry. please use soynuggets or paneer.and you can add Cauliflower, peas and mushrooms too.